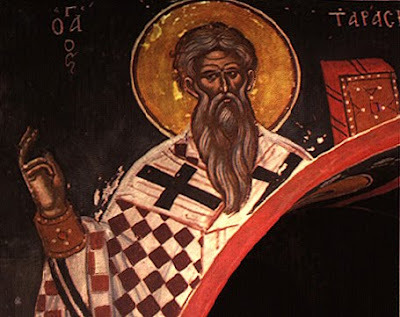 After the repose of Saint Tarasios, Patriarch of Constantinople, many visited his tomb and in his monastery resorting to his relics with faith for miraculous cures. A woman suffering from hemorrhaging imitated the woman who, as we read in the Gospel, was afflicted with a chronic issue of blood. Since the saint's monastery, from the time of the saint, had the rule of excluding female pilgrims, women with an issue of blood contrived other means to enter. Since they had grown weary of expending fortunes on physicians and ingesting all kinds of drugs to find relief, these women donned manly garb, disguised their faces, and set forth for the saint's tomb at the monastery. Many feigned that they were eunuchs that they might gain access. Then each would approach Saint Tarasios' tomb and fall prostrate in prayer before his relics. Each petitioner would draw oil from the lamp suspended over his relics and anoint herself. They all, without exception, speedily received a wondrous healing from the saint. They returned to their homes giving glory to God and thanking Saint Tarasios. From The Great Synaxarion of the Orthodox Church, translated by Holy Apostles Convent, p. 944.